A lot of outlets treat April 1 like it’s a day to completely upend the basic tenet of journalism and instead run a bunch of stories that simply aren’t true. But here at Streetsblog, we’re dead serious about the truth, so we would obviously never stoop to printing fake stories on so-called April Fool’s Day — no matter how perfectly they satirize the current road safety stasis from the de Blasio administration and the NYPD. 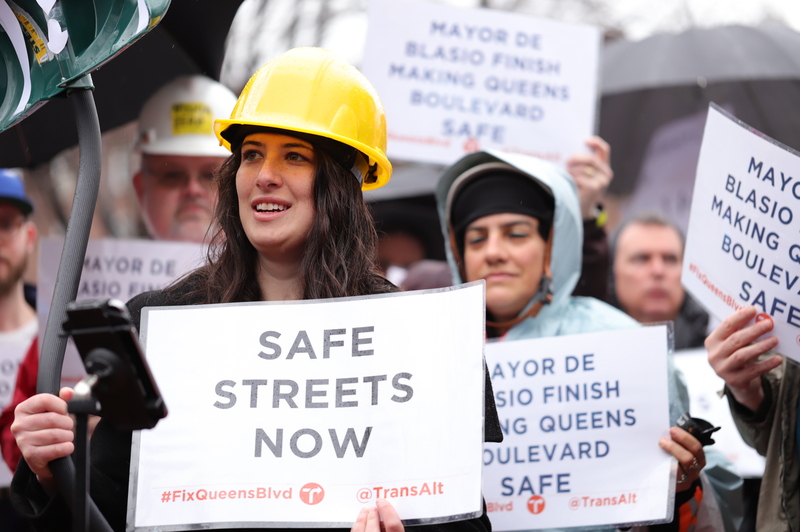 The biggest news from our perspective on Sunday was the massive rally in support of the final phase of the Queens Boulevard safety redesign, which is stalled because Mayor de Blasio hasn’t decided yet whether to capitulate to the car-owning minority or to make roadways safer. Coverage by WCBS88 focused on the parking vs. safety choice. Friend of Streetsblog Steve Bodzin sent us great photos (one of which leads this page today). The Post’s Rich Calder drilled down on Mayor de Blasio’s promise last week to cut the size of the city car fleet with a detail that most outlets left out: The number of workers who get a city car for personal use has soared under this mayor. It’s more evidence that de Blasio still considers a car a reasonable perk. The Daily News editorial board came out in favor of more cops enforcing fare evasion, slamming Council Speaker Corey Johnson for saying that busting people for skipping out on the fare is basically criminalizing poverty. Whatever side you’re on, this is a weird position for New York’s Hometown Paper to take. Fare evasion is not likely as severe a problem as the law-and-order crowd says it is. The NY Post explains why you’ll be seeing more cops working as “scarecrows” near the turnstiles in a few subway stations in Manhattan. And, OK, we have to admit, sometimes it’s a good idea to bust turnstile jumpers (NY Post). Meanwhile, the Daily News reported on a cop who was busted for writing fake tickets against cyclists so he could get overtime pay. It’s evidence of two things: 1. some cops are on the take and, more important, 2. tickets against cyclists are written so gratuitously that a dirty cop thought he could just write them and no one would care. In case you wanted to read the congestion pricing legislation as written, it’s posted here. Here’s a throwback to the New York Times’ coverage of Streetsblog from 12 years ago — the last time congestion pricing looked like it was going to become reality. Reading Sewell Chan’s June 14, 2007 article, it’s funny to see how little has changed (except for Chan, who is now leading the Los Angeles Times newsroom!). And, finally, the 103rd Precinct in Queens put out a tweet that pretty much enraged everyone who has ever ridden a bicycle. This is easily the worst tweet we have ever seen @NYPDnews put out. @NYPDONeill needs to address the egregious bias against people who get around by bike (“Love ‘em or hate ‘em”??! Are you insane?). And a crumpled bicycle? Imagine if someone tweeted an pic of a badly injured cop! This will work out great. Let’s let a board of non elected officials, who can’t be held accountable for their decisions, make all the decisions. This is a phenomenal punting of accountability. Constituents: The MTA is still a garbage fire, and congestion pricing has done nothing to alleviate congestion. Elected official: My hands are tied. The BOARD made those decisions, not me. I TRIED to fix it, but it was taken out of our hands. Also of note: Cuomo dumping the pied-a-terre tax because he needs wealthy real estate magnates to fund his 4th term campaign. One thing the Board could do is keep a smaller charge for using West Street and the FDR after crossing the currently free bridges, but also cut the toll to the existing TBTA crossings for those who don’t enter the CBD. Makes it equal regardless of crossing, and stops vehicles from going out of their way to the currently free crossings when using West Street and the FDR. The coverage I’ve seen says that Lincoln/Holland tunnel drivers will get their Tunnel tolls credited to the congestion charge (roughly same price), but GWB drivers will not. Wouldn’t this cause toll shopping by those who are currently taking the GWB to get into the congestion zone now? May cause them to take longer routes to avoid a double tolling situation, which is something we don’t really want. Why would journalists treat April 1 any different from every other day (cough, “dossier,” cough)? I still think the MoveNY plan was far better. A comprehensive re-balancing of incentives rather than a piecemeal approach of credits and exemptions. I’m eager for congestion pricing, but I dread the corruption that will come with it.